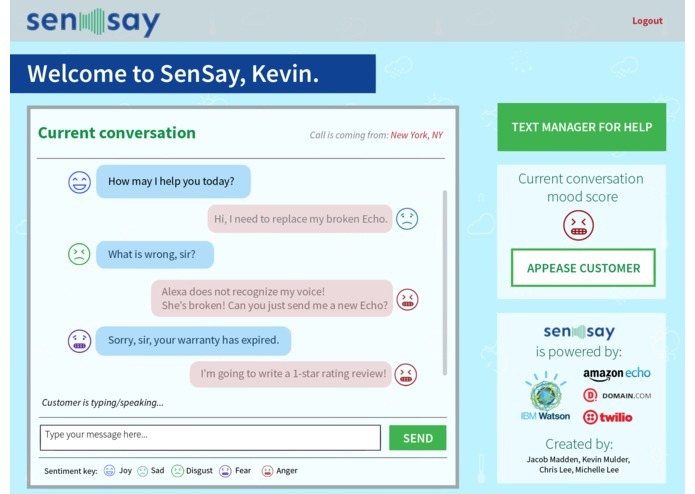 SenSay provides customer service reps real-time feedback of the conversation that he/she is having, with Watson identifying the sentimental tones of the dialogue. Whether it is through the on-screen chat or voice (using Amazon Echo), SenSay recognizes the mood expressed in the user's language. Used the IBM Watson services, specifically the Tone Analyzer and Personality Insights. Used the watson-developer-cloud node-sdk for making the API calls to the Watson services. Wrote in nodejs with a foundation of an express.js web server. Used the Amazon Alexa Skill API for interfacing with the Amazon Echo, which calls AWS Lambda to trigger the sentiment analysis. 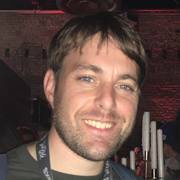 Used socket.io for real-time communication and updating between the server and clients. Integrated Twilio as part of a two-way text messaging (SMS) feature. ...and utilized the .CLUB domain for prominence and easy access on the web. As Watson's emotional intelligence was only condensed into five different states (joy, fear, disgust, anger, sadness), the biggest challenge was capturing the proper mood of each spoken phrase while relating to one of the five available. We also had to improvise, for Alexa and Watson would not be able to differentiate specific voice volume and intonations. We used a heavy amount of experimentation and a custom diagnoser to categorize all spoken interactions into their respective mood assignments. Also, we were a newly formed rookie team, having just met at the hackathon, and had to work out each other's strengths and weaknesses rapidly. We integrated several powerful APIs into a single dashboard allowing for meaningful real-time feedback. We came together and formed a strong team. We stayed positive and successfully delivered a compelling prototype capable of demonstrating our ideas fully. Providing an aggregated graph/chart report of the customer rep's service to his/her customers. Having the ability to analyze a particular customer's mood and preferences (e.g., clicking into seeing personality types, buying preferences, demographics, etc.). Creating a summary report of the customer service rep relative to the customer satisfaction they bring. Most importantly, SenSay and its sentiment analysis expertise can be applied beyond customer service relationships for applications such as sales pipeline and call management or used during the hiring process with potential candidates. We learned how to come together as a team and work hard throughout the night. We also learned a lot more about the IBM Watson service capabilities. This was the first time usage of Amazon Echo for everyone on our team. Overall, it was an evening full of exposure to new technologies for our team. I participated in the brainstorming for ideas phase, worked on several of the web server back-end pieces including service calls. I helped with testing, minor front-end modifications and the presentation preparation. Full stack software developer, artificial intelligence & machine learning researcher.